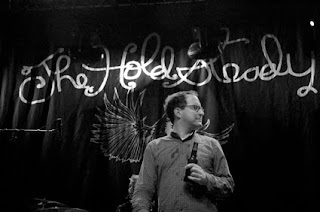 I love me some Hold Steady, I think Finn is one of the top 5 rock and roll lyricists and Tad Kubler (cool interview here) is one mean guitarist. They are the Lex Luger of the rock scene...yup The Total Package RnR band. I thought Stay Positive was a growing up/transitional album a step below their previous two releases, so I am very excited to see what they bring to the table this time. Lost in Fog and Love and Faithless Fear...I've had kisses that make Judas seem sincere.